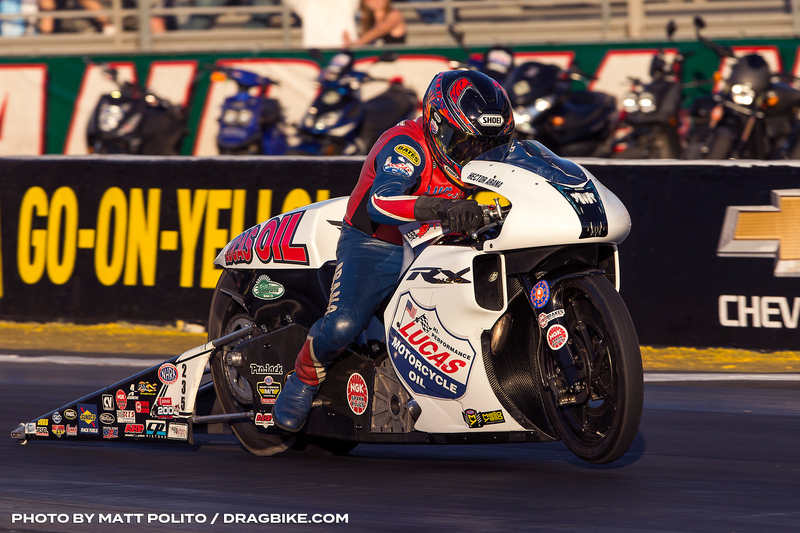 Matt Smith defeated Eddie Krawiec in the final round of the Auto Club NHRA Finals to become the 2018 Mello Yello NHRA Drag Racing Series Pro Stock Motorcycle world champion. 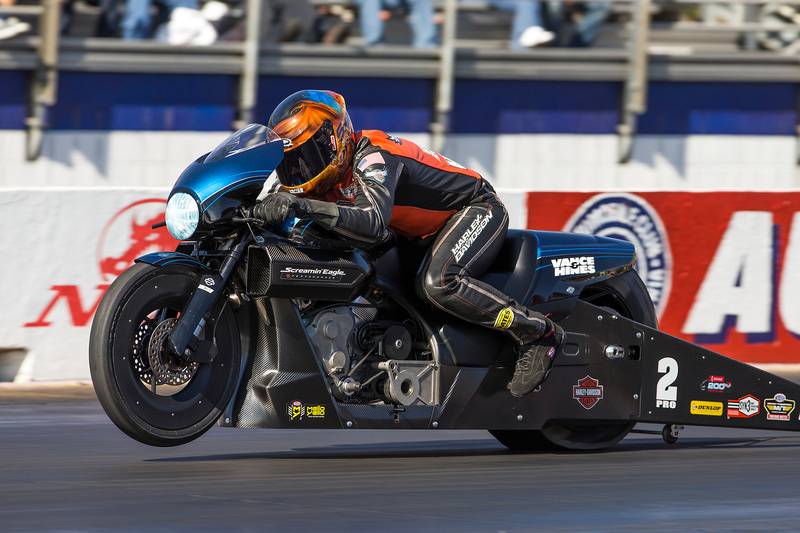 As if beating Krawiec down the track wasn’t enough, Smith also set a speed record in the two-wheel category by going 201.65 mph on his Elite Performance EBR. 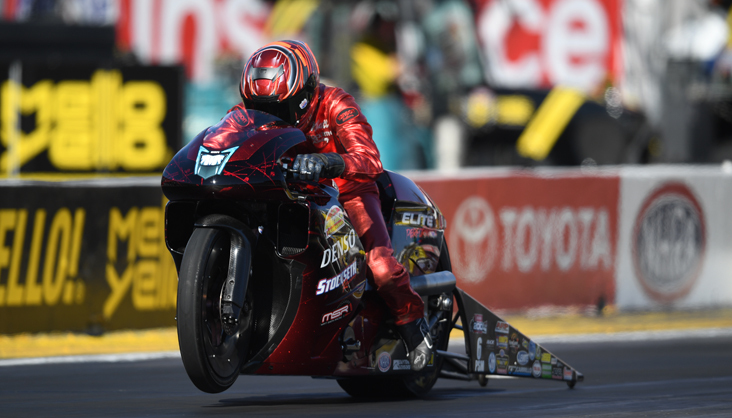 Smith started the season at the Amalie Motor Oil NHRA Gatornationals driving someone else’s motorcycle –- a partnership that ended in not-so-spectacular fashion. From there, he managed to use his partnership with Mark Stockseth to hook up with Elite Performance and eventually get his hands on an EBR body. He used that superior piece of aerodynamics to his advantage, eventually surging towards the top of the leaderboard. Smith entered the Countdown to the Championship in the No. 6 position, leaving him with work to do in the playoffs. 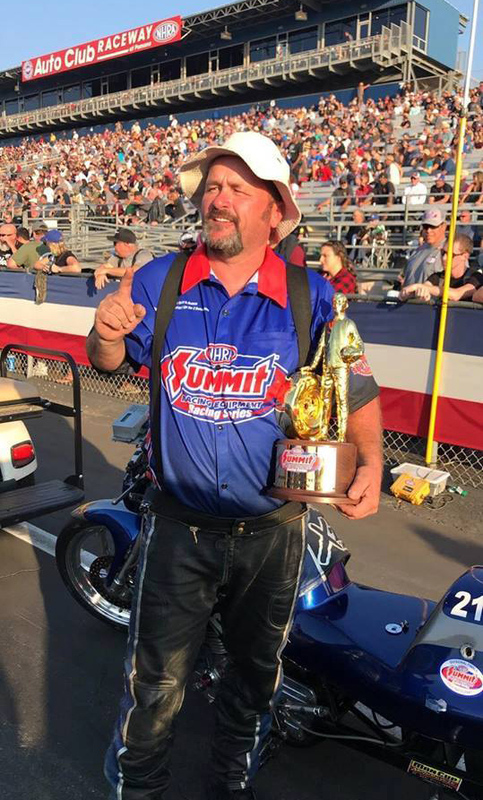 Smith got right after it -– reaching the final round at the Dodge NHRA Nationals and then winning the AAA Insurance NHRA Midwest Nationals a week later. Smith went on to win three times during the Countdown to go along with his one regular-season victory. He now has 22 career victories in 243 starts. 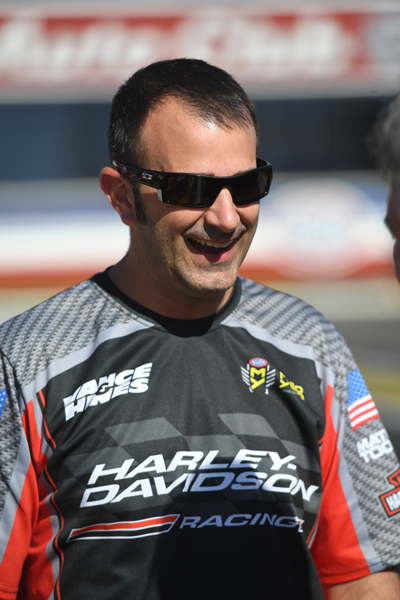 His meeting with Krawiec in the final round was his first in regular NHRA competition in 2018. The two met up during the Mickey Thompson Pro Bike Battle in Sonoma, and Smith got the better of that matchup, too. Smith had to beat three former champions: Hector Arana Sr., LE Tonglet and then Krawiec, to collect his third championship. He defeated his wife, Angie Smith, in the first round of competition, after qualifying No. 1 for the fifth time this season. Eliminations Round 1: There are still four riders in contention for the championship after the first round of competition, including Eddie Krawiec. He made the quickest pass of the session (6.802) and will take on Jerry Savoie in a battle of the 2017 and 2016 champs. Matt Smith got what was effectively a solo round when Angie Smith didn’t take the tree after performing a massive burnout. That worked out for Matt, because his bike hit the rev limiter at about half track. Hector Arana Jr. and LE Tonglet both advanced to the second round, keeping their slim title hopes alive. Eliminations Round 2: Matt Smith eliminated Hector Arana Jr. and LE Tonglet in one fell swoop by defeating Hector Arana Sr. in the second stanza of action. The championship battle will continue to the semifinals, though, because Eddie Krawiec got past 2016 champion Jerry Savoie by nearly a tenth of a second. That sets up a big-time showdown in the semi’s as Smith will battle Tonglet and Krawiec will take on Arana with Krawiec needing to advance to keep his championship hopes alive. Smith just needs Krawiec to lose to clinch his third title. 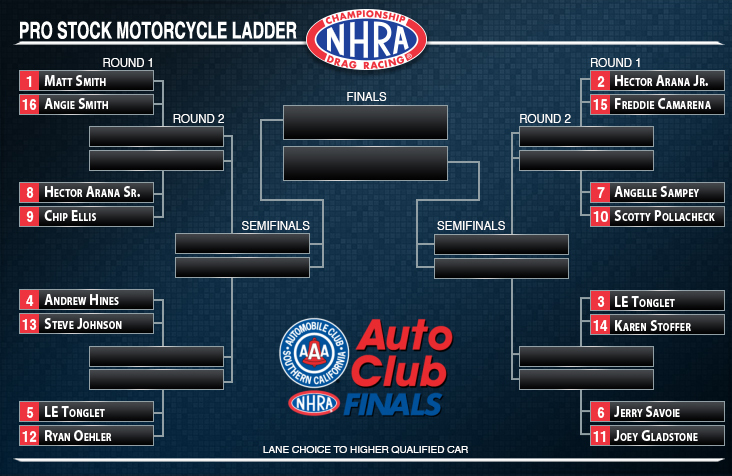 Eliminations Round 3: We’re getting a winner-take-all final in the two-wheel category. 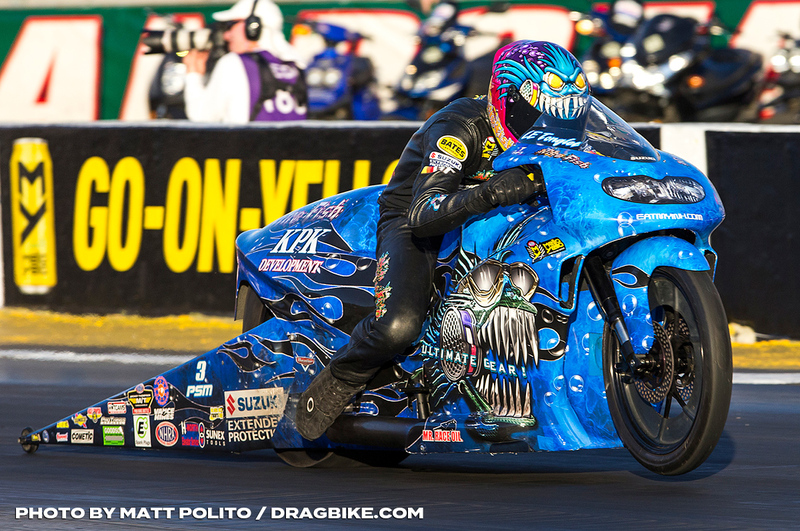 Matt Smith dominated LE Tonglet with another 200-mph run and secured lane choice over Eddie Krawiec. 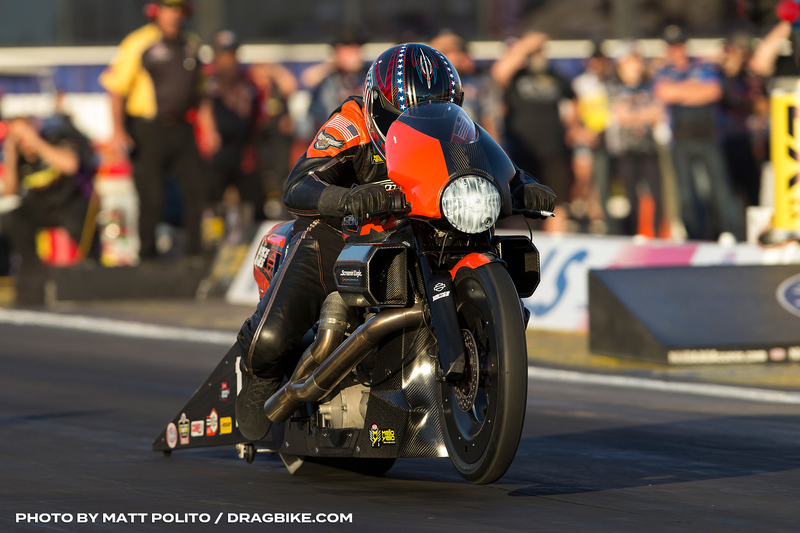 The Harley-Davidson rider dispatched Hector Arana Jr. to give himself a chance at back-to-back Pro Stock Motorcycle championships. He’s giving up nearly a tenth of a second to Smith entering the final round of competition, so he’ll have his work cut out for him chasing down the No. 1 qualifier. 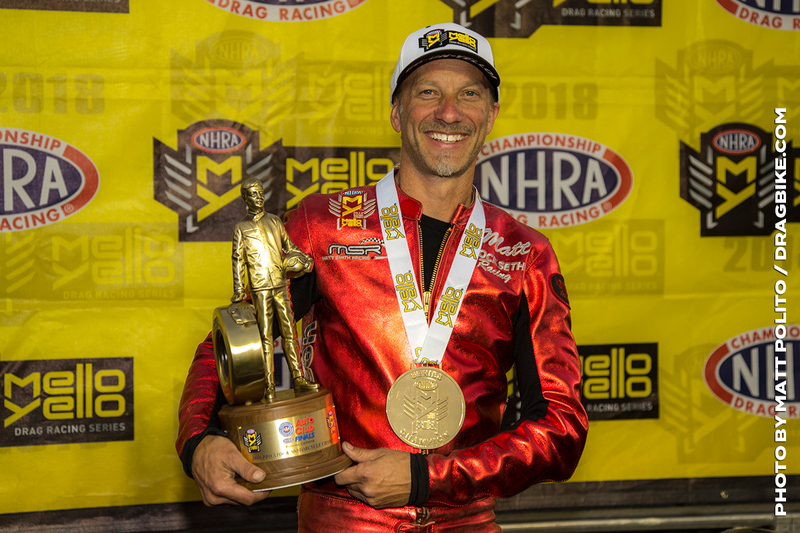 Eliminations Round 4: Matt Smith, near lane, made the fastest run in Pro Stock Motorcycle history (201.22 mph) to earn his third Mello Yello NHRA Drag Racing Series title. Smith left at the same time as Eddie Krawiec, pulled a better 60-foot time and then pulled away to bring home a title for Elite Performance. It’s his first title since 2013. 12:25 p.m. Weather conditions: air temperature 74 degrees, relative humidity 21 percent, barometer 28.91 inches, adjusted altitude 2,492 feet, track temperature 101 degrees. Savoie is 2 - 0 against Gladstone in prior events. Gladstone goes red and gives the easy win to Savoie. Jerry Savoie's incremental times: 60ft-1.045 sec., 330ft-2.834, 660ft-4.358/160.25 mph, 1,000ft-5.692. Joey Gladstone's incremental times: 60ft-1.103 sec., 330ft-2.930, 660ft-4.486/156.92 mph, 1,000ft-5.848. Arana is 6 - 4 against Ellis in prior events. Ellis goes red this time and Arana makes another strong pass for the easy win. Hector Arana's incremental times: 60ft-1.093 sec., 330ft-2.896, 660ft-4.418/161.05 mph, 1,000ft-5.743. Chip Ellis' incremental times: 60ft-1.063 sec., 330ft-2.847, 660ft-4.370/161.17 mph, 1,000ft-5.696. Pollacheck is 4 - 2 against Sampey in prior events. Angelle Sampey's 2 wins here came in 2001 & 2004 and her runner-up finishes were in 2003 & 2016. This is the 105th start for Scotty Pollacheck. He has a career 46% round win record with 55% in round one. Pollacheck gets the advantage at the green, but Sampey just gets by at the 1000 foot lights for the win. Angelle Sampey's incremental margins (negative if behind): 60ft(-0.033), 330 ft(-0.027), 660ft(-0.012), 1,000ft(0.002). MOV: 0.0104 seconds (approximately 3 feet). Angelle Sampey's incremental times: 60ft-1.075 sec., 330ft-2.865, 660ft-4.389/160.59 mph, 1,000ft-5.722. Scotty Pollacheck's incremental times: 60ft-1.059 sec., 330ft-2.855, 660ft-4.394/158.80 mph, 1,000ft-5.741. Tonglet is 1 - 0 against Oehler in prior events. Tonglet starts eliminations with a 61 point gap to make up in the Chase. He is making his 293rd round of racing today and has a career 62% win record. He has 64% advantage in round one parings. Oehler is making his sixteenth first round appearance and has won twice. Big starting line advantage for Oehler, but the bike doesn't have the power to match and Tonglet is on by before half track for the win. LE Tonglet's incremental margins (negative if behind): 60ft(-0.023), 330 ft(-0.016), 660ft(0.006), 1,000ft(0.026). MOV: 0.0427 seconds (approximately 12 feet). LE Tonglet's incremental times: 60ft-1.070 sec., 330ft-2.866, 660ft-4.383/161.42 mph, 1,000ft-5.709. Ryan Oehler's incremental times: 60ft-1.086 sec., 330ft-2.889, 660ft-4.428/158.86 mph, 1,000ft-5.774. Hines is 30 - 7 against Johnson in prior events. Andrew Hines is the defending event champion. He also won here in 2011 & 2012. Johnson is making his 632nd round of racing and has an overall 38% win record. He is 41% in the first round. Just 0.002 difference in RTs and Hines pulls steadily ahead for the win. He will have lane choice over Tonglet next round. Andrew Hines' incremental times: 60ft-1.067 sec., 330ft-2.846, 660ft-4.364/161.50 mph, 1,000ft-5.688. Steve Johnson's incremental times: 60ft-1.067 sec., 330ft-2.918, 660ft-4.465/158.39 mph, 1,000ft-5.816. Arana Jr is 4 - 0 against Camarena in prior events. Hector Arana Jr. was the 2014 winner at this race. His win in Las Vegas was his 14th and that ties him with Craig Treble for 10th place on the motorcycle win list. 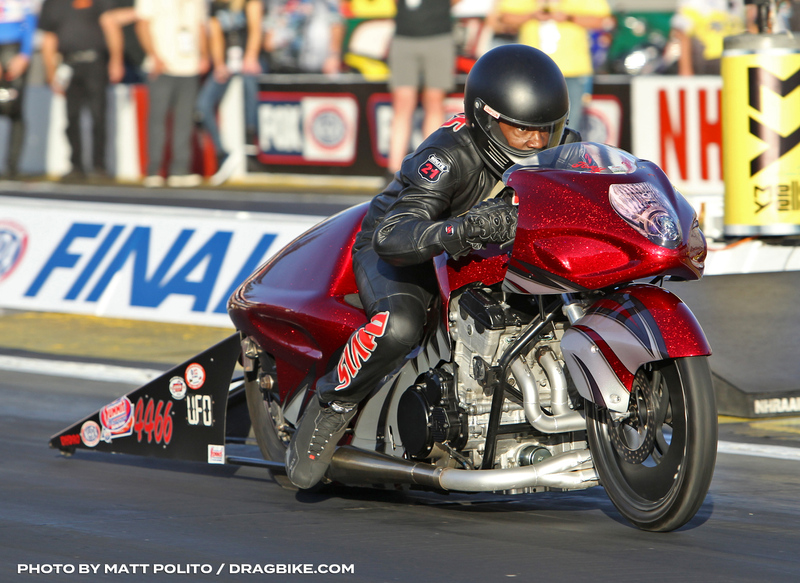 When he won in Vegas he became the first PSM rider to "sweep" an event this year, i.e., he qualified #1, set low elapsed time, top speed and won the race. He comes into the day just 64 points behind Smith in the Championship race. Freddie Camarena is making his 54th start. Camarena is dead late and give the easy win to a charging Arana. He keeps lane choice over Sampey next round. Hector Arana Jr's incremental times: 60ft-1.055 sec., 330ft-2.846, 660ft-4.363/161.46 mph, 1,000ft-5.691. Krawiec is 21 - 8 against Stoffer in prior events. 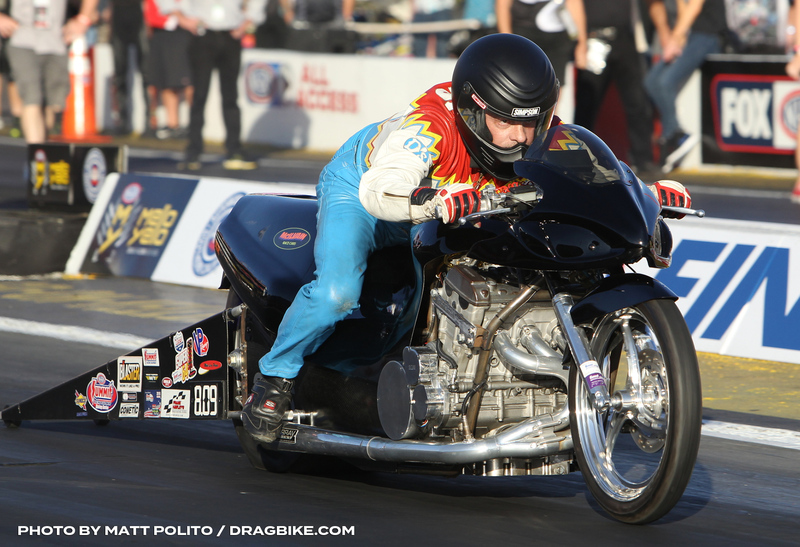 Eddie Krawiec's 4 wins are the most for any active motorcycle driver at this event. He also has been runner-up 5 times. He is 10 -2 in round 1 here and has an 85% record in all round one parings. This is the 213th start for Karen Stoffer and here 16th from the #14 spot. She is 2 -13 in round 1 when after qualifying 14th. She has already been in 323 rounds of racing with a 45% win record. She is almost 50% in round one races. Stoffer gets away first and stays out there until right before the 330lights. Krawiec rides on by for a big win. He will have lane choice over Savoie in round two. Eddie Krawiec's incremental times: 60ft-1.064 sec., 330ft-2.840, 660ft-4.351/161.81 mph, 1,000ft-5.671. M. Smith is 10 - 4 against A. Smith in prior events. Matt Smith is already having a good day, as he celebrates his 36th birthday! He won the "Finals" in 2016 & 2007. This is his 31st #1 spot. He hasn't won a race from the top spot in his last 13 tries. The top qualifier in the bike class is 29 -2 in round 1 at this event. 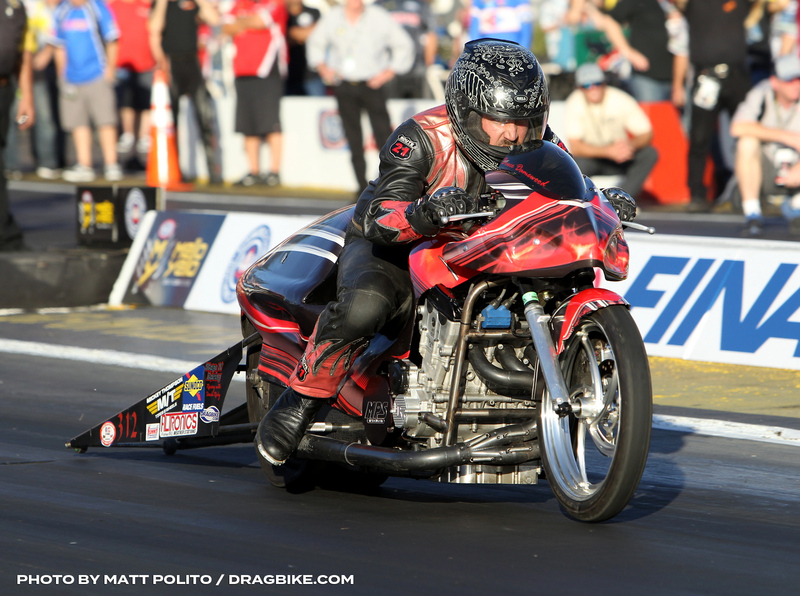 In qualifying this weekend, he captured the new Pro Stock Bike Speed record with a stellar 201.10 MPH pass. This is the 16th time that Angie Smith has qualified 16th. She is 3 - 12 in round wins, when after qualifying 16th. This will be her 196th round of racing. What was going to be a husband and wife shootout, ens before the green, as Angie bike dies and will not restart. Matt was a sitting duck, as the engine sky rockets at the shift and goes up hard on the rev limiter! He will give up lane choice toArana next round. 1:50 p.m. Weather conditions: air temperature 75 degrees, relative humidity 18 percent, barometer 28.89 inches, adjusted altitude 2,558 feet, track temperature 101 degrees. Smith is 19 - 10 against Arana in prior events. THe reason for Smith's problem in round one one was the air line for the shifter broke. No other damage. He gets away first and runs another 200 MPH pass for easy win. The sixth fastest ever. A strong pass for Arana to no avail. Hector Arana's incremental times: 60ft-1.064 sec., 330ft-2.862, 660ft-4.391/159.89 mph, 1,000ft-5.726. Matt Smith's incremental times: 60ft-1.057 sec., 330ft-2.850, 660ft-4.363/162.37 mph, 1,000ft-5.676. Arana gets a big starting line advantage and holds off a charging Sampey for the holeshot win. Hector Arana Jr's incremental margins: 60ft(0.052), 330 ft(0.030), 660ft(0.035), 1,000ft(0.033). MOV: 0.0291 seconds (approximately 8 feet). 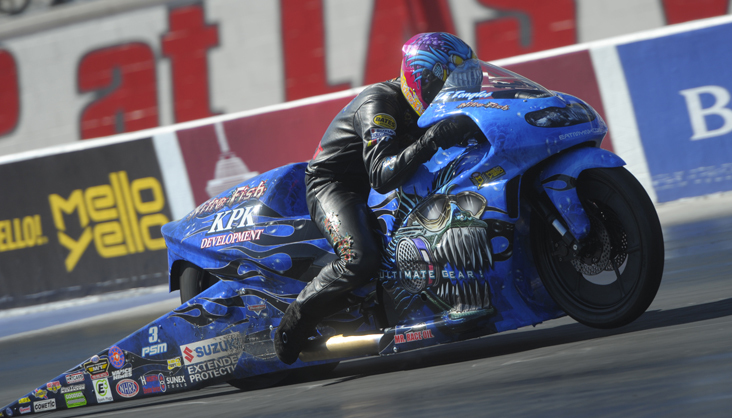 Hector Arana Jr's incremental times: 60ft-1.096 sec., 330ft-2.914, 660ft-4.444/159.89 mph, 1,000ft-5.788. Angelle Sampey's incremental times: 60ft-1.096 sec., 330ft-2.892, 660ft-4.427/159.57 mph, 1,000ft-5.769. Tonglet is 18 - 13 against Hines in prior events. Tonglet is away first and just holds off a quicker Hines for the close win. He will face Smith next round. LE Tonglet's incremental margins: 60ft(0.024), 330 ft(0.017), 660ft(0.015), 1,000ft(0.013). MOV: 0.0125 seconds (approximately 4 feet). Andrew Hines' incremental times: 60ft-1.073 sec., 330ft-2.864, 660ft-4.389/160.54 mph, 1,000ft-5.719. LE Tonglet's incremental times: 60ft-1.068 sec., 330ft-2.866, 660ft-4.393/160.48 mph, 1,000ft-5.725. Krawiec is 22 - 7 against Savoie in prior events. Krawiec keeps his championship hopes alive with the win. Savoie is away first and stays there to the 330 lights, where they are dead even. Krawiec starts a steady pull ahead for the win. He has lane choice over Arana Jr. in round three. Eddie Krawiec's incremental margins (negative if behind): 60ft(-0.014), 330 ft(0.000), 660ft(0.028), 1,000ft(0.054). MOV: 0.0780 seconds (approximately 22 feet). Eddie Krawiec's incremental times: 60ft-1.065 sec., 330ft-2.841, 660ft-4.348/162.39 mph, 1,000ft-5.665. Jerry Savoie's incremental times: 60ft-1.053 sec., 330ft-2.843, 660ft-4.378/159.40 mph, 1,000ft-5.721. 2:58 p.m. Weather conditions: air temperature 77 degrees, relative humidity 16 percent, barometer 28.90 inches, adjusted altitude 2,622 feet, track temperature 100 degrees. Two not so good lights, with Tonglet getting a narrow 0.004 advantage. They run together until near half track, where there is smoke from the engine and he slows. Smith continues to dominate with yet again another 200 plus run that ties for 10th fastest. Matt Smith's incremental margins: 60ft(0.005), 330 ft(0.019), 660ft(0.033), 1,000ft(0.120). MOV: 0.3587 seconds (approximately 82 feet). Matt Smith's incremental times: 60ft-1.052 sec., 330ft-2.834, 660ft-4.343/162.96 mph, 1,000ft-5.649. Krawiec is 16 - 9 against Arana Jr in prior events. Krawiec is away first and slowly pulls steadily ahead to take the decisive win over a strong Arana. He will give up lane choice to Smith in the final round later. Eddie Krawiec's incremental times: 60ft-1.083 sec., 330ft-2.872, 660ft-4.398/160.82 mph, 1,000ft-5.726. Hector Arana Jr's incremental times: 60ft-1.080 sec., 330ft-2.894, 660ft-4.433/158.91 mph, 1,000ft-5.776. They leave right together with identical RT's and Smith gets the early lead. They stay right together al the way to near the 1000 foot lights, where the Elite Power kicks in and Smith not only takes a big win, but runs the fastest bike speed ever. That resets his National Speed record too! Amazing. 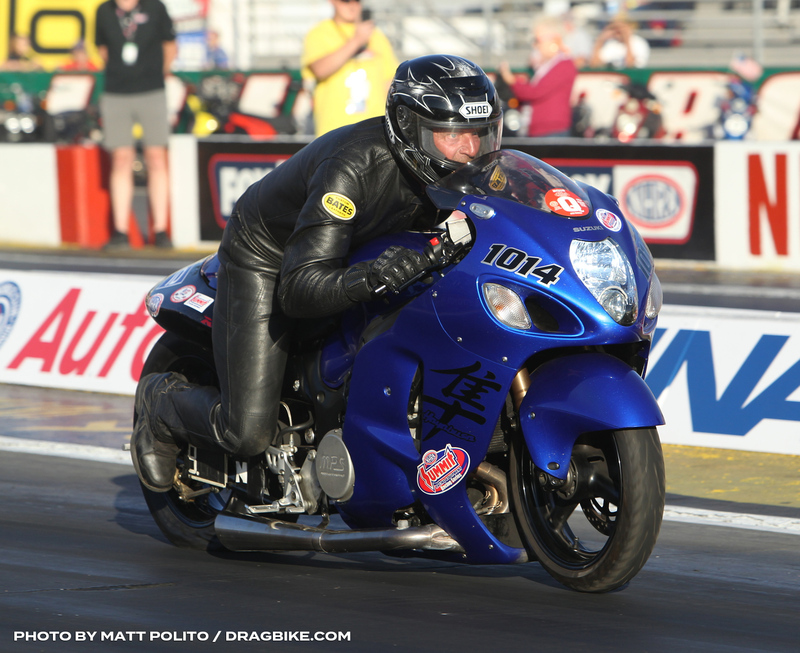 Matt Smith is the Pro Stock Bike Champion! Krawiec was right there all the way down the track and runs his best speed of the day, with the second quickest ET. He did all he could but to no avail! Matt Smith's incremental margins: 60ft(0.018), 330 ft(0.014), 660ft(0.016), 1,000ft(0.030). MOV: 0.0471 seconds (approximately 14 feet). Eddie Krawiec's incremental times: 60ft-1.089 sec., 330ft-2.867, 660ft-4.369/162.53 mph, 1,000ft-5.684. Matt Smith's incremental times: 60ft-1.071 sec., 330ft-2.853, 660ft-4.353/163.83 mph, 1,000ft-5.654. 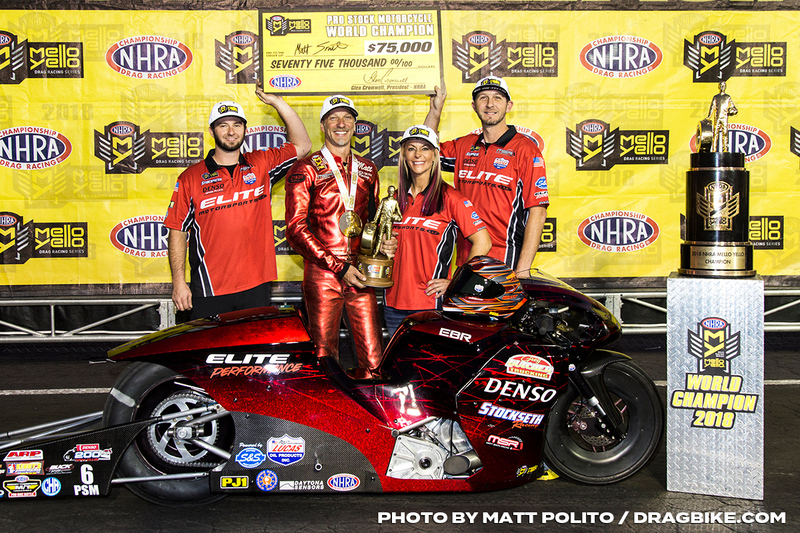 Matt Smith secured his third NHRA Mello Yello Drag Racing Series Pro Stock Motorcycle world championship in the final round of eliminations. 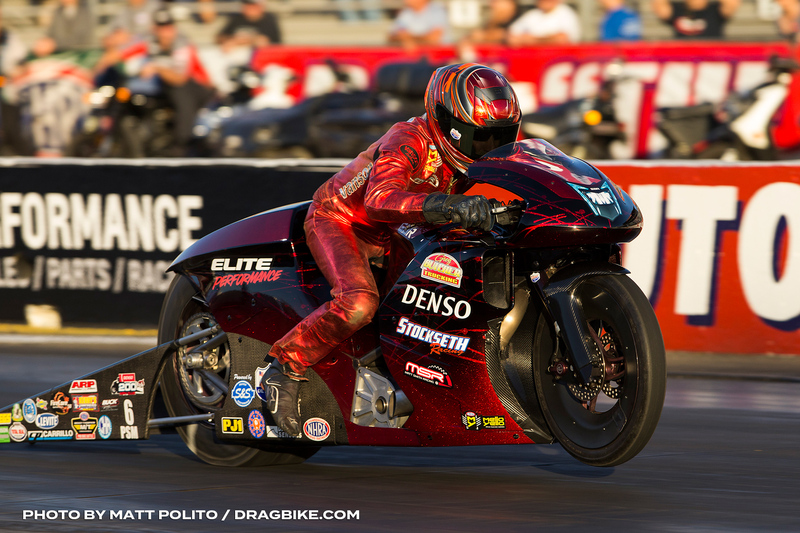 He powered his Elite Motorsports DENSO Auto Parts EBR to a 6.765 at 201.22 national speed record pass to defeat defending world champion Eddie Krawiec, who was the nearest championship contender. M. Smith defeated Angie Smith, Hector Arana and LE Tonglet en route to the finals to secure the championship and event title. This is his first world championship title since 2013. 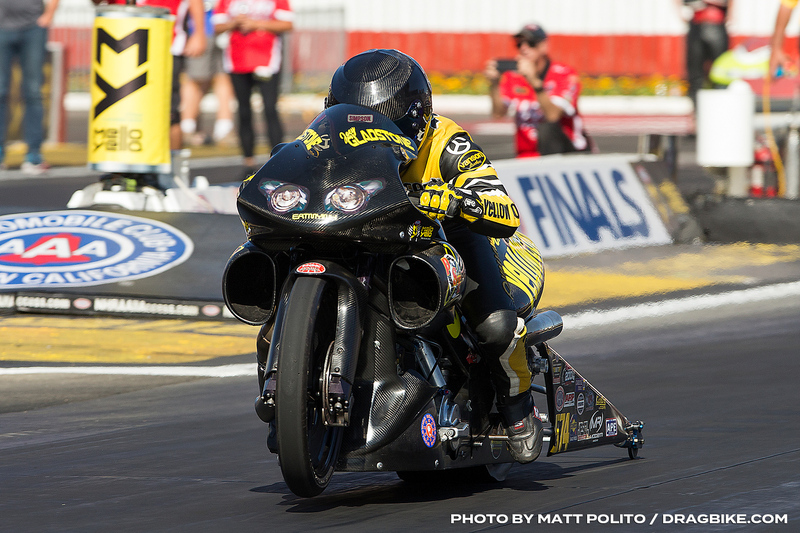 The final race day of the season in Pro Stock Motorcycle reveals some not-so-surprises statistically. Yes, Matt Smith and Eddie Krawiec have very quick motorcycles and Joey Gladstone remains one of the best leavers in the category. But those who haven’t been paying attention to Angie Smith’s great bounce-back season may not have noticed she’s been No. 1 in reaction time average in 2018. 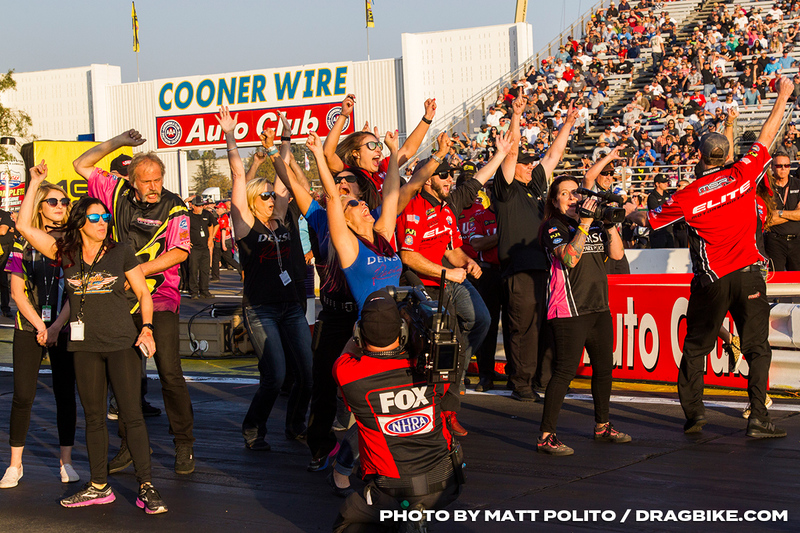 That’s why we’re rolling out these stats to get everyone up to speed before the season officially wraps up with the Auto Club NHRA Finals in Pomona. It’s worth noting Matt Smith is just outside the success rate leaderboard with a 76.7 mark and he’s also been significantly better during the Countdown to the Championship. He boasts an 89.5 success rate and a 6.869 e.t. during the playoffs, which just might explain why he’s battling for his third Pro Stock Motorcycle championship. Hector Arana Jr. and LE Tonglet are huge fans of Chip Ellis and Hector Arana Sr. That’s because either Ellis or Arana will race Matt Smith in the second round, assuming he defeats Angie Smith in the first round Sunday. 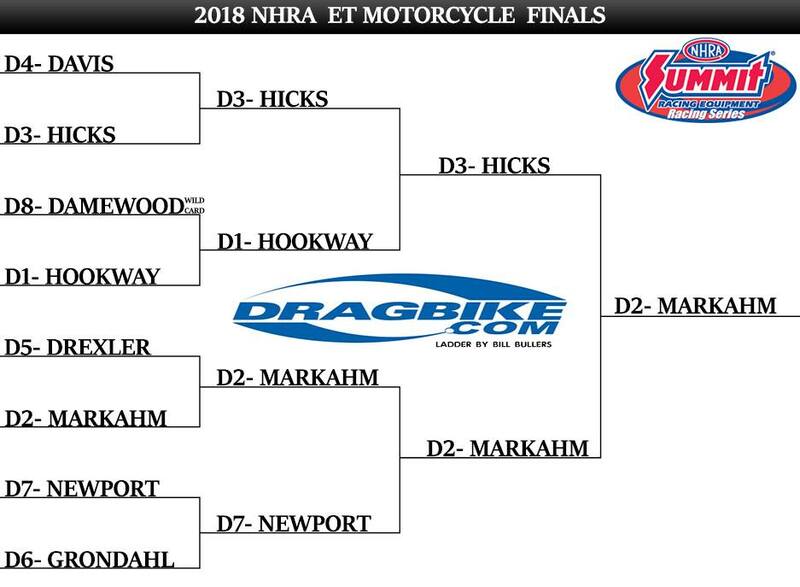 If Smith advances to the second round, the only way for Arana or Tonglet to win a Pro Stock Motorcycle championship is for him to lose and for them to win the whole race. That’s admittedly a tall task, but it’s the hand the two have been dealt at the Auto Club NHRA Finals. Tonglet will face Ryan Oehler in the first round of eliminations coming from the No. 5 position, while Arana battles Freddie Camarena from the No. 2 position. The other racer still in championship contention, Eddie Krawiec, controls his own destiny. That’s because he can get his second-straight title by simply going one more round than Smith. The earliest the two can race is the final round because they’re qualified on opposite sides of the Pro Stock Motorcycle bracket. 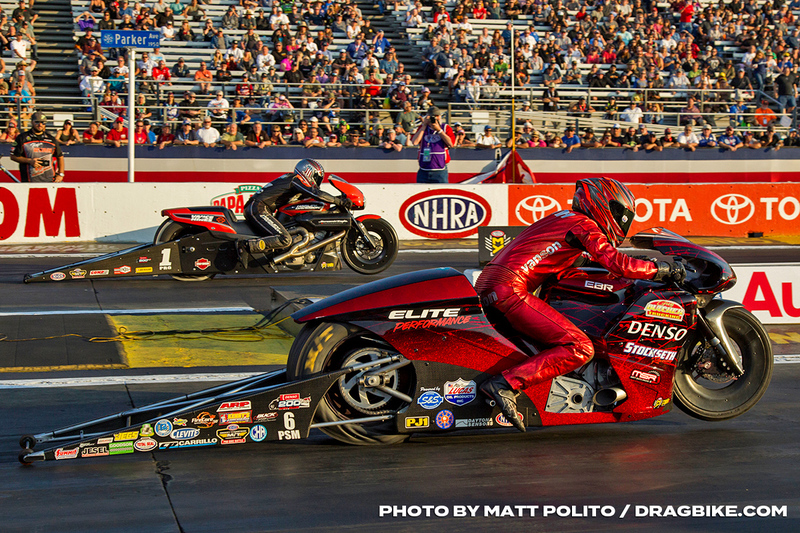 If they face off in the final, it will be the first time they have faced this season in an official NHRA race. 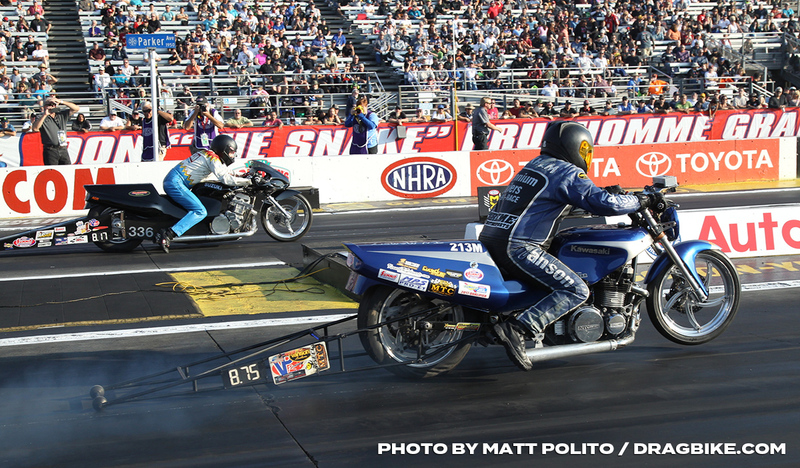 They squared off against one another in the Mickey Thompson Pro Bike Battle in Sonoma, with Smith getting the victory. For Smith, the math is simple: Win the race and become the champion. In reality, all he needs to do is go the same number of rounds as Krawiec and he’ll become a champion for the third time in history. He wouldn’t mind doing it in dramatic fashion, though. After all, this is Rickie Smith’s son we’re talking about. 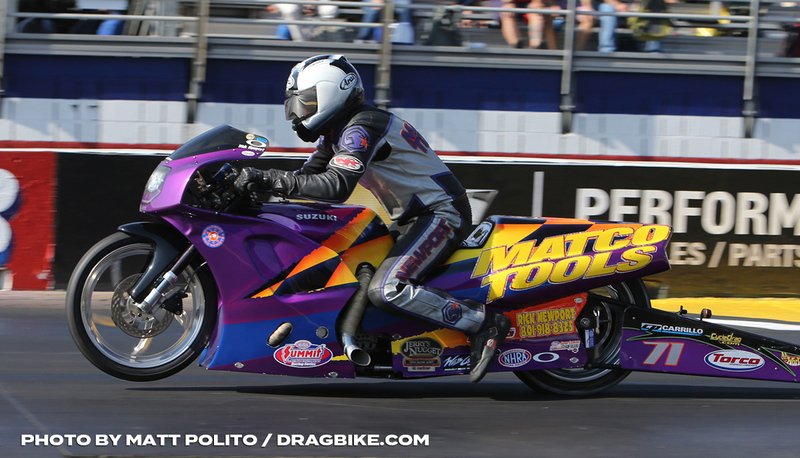 In Pro Stock Motorcycle, Matt Smith, the points leader, secured his fifth No. 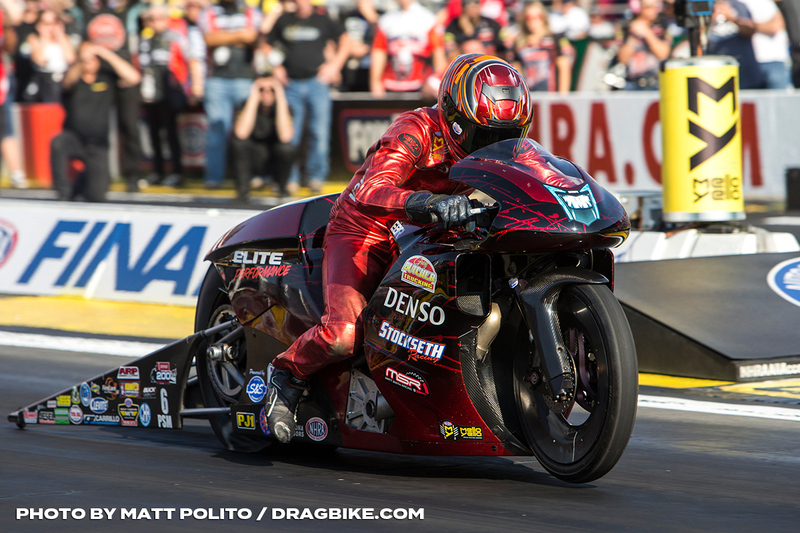 1 qualifier of the season, 31st of his career and second during the Countdown to the Championship by racing his Elite Motorsports DENSO Auto Parts EBR to a 6.754 at 201.10. 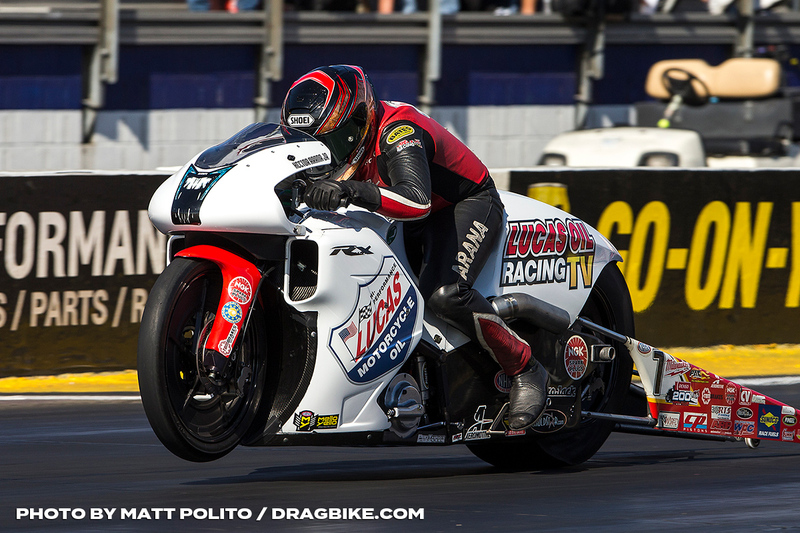 Matt Smith made the fastest Pro Stock Motorcycle pass in history, 201.10 in the day’s first qualifying session and held onto the No. 1 qualifying position. Matt Smith will open eliminations against his wife, Angie Smith. Hector Arana Jr. is qualified second after a 6.781 at 197.57 on his Lucas Oil Racing TV EBR and he’ll line up against Freddie Camarena. Defending world champion Eddie Krawiec is qualified third and in contention for his fifth world championship. 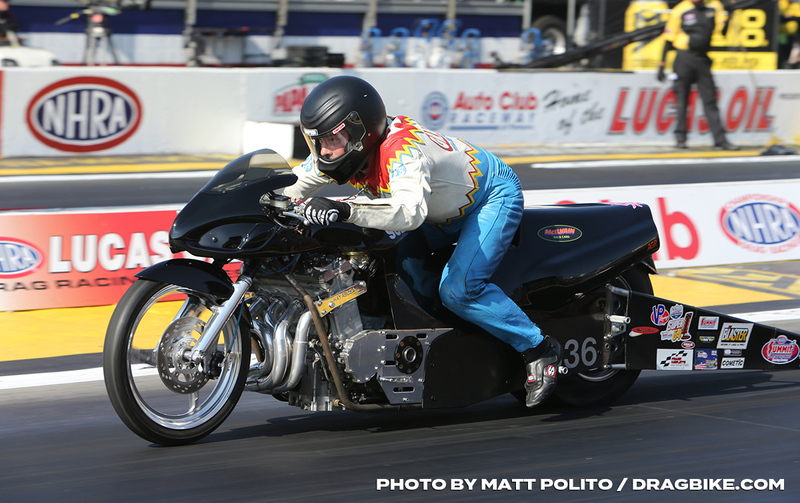 Qualifying Round 3: Matt Smith continues to step up his performance, this time making a 201.1-mph run. 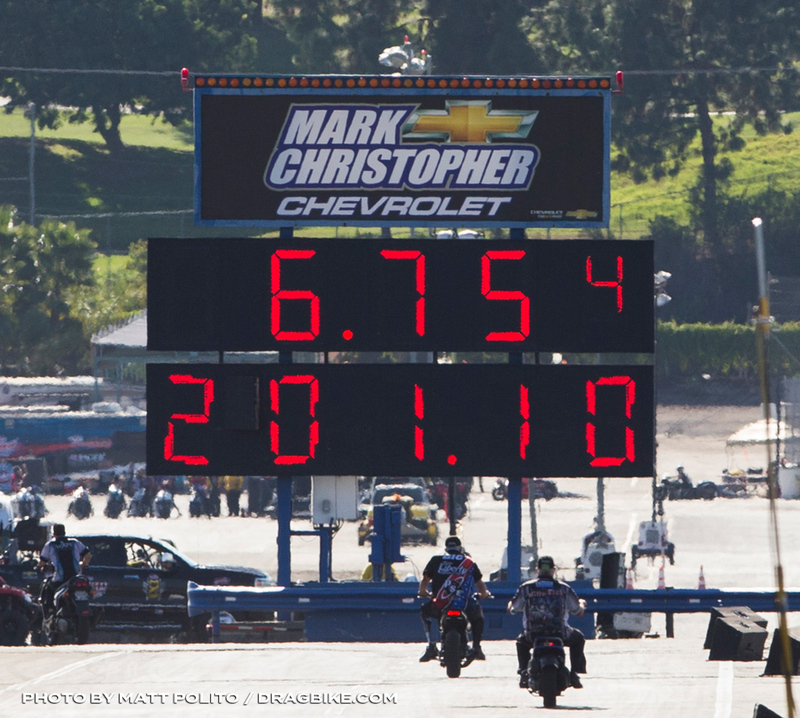 That’s the fastest run ever recorded in Pro Stock Motorcycle. He paired it with a 6.754 to stay at the top of the field and earn four bonus points. That picked up one point on Eddie Krawiec, increasing his lead to a solid 10 points. Perhaps more importantly: Smith has the best bike at Auto Club Raceway at Pomona right now, and everyone else only has one run left to catch up before race day begins. Qualifying Round 4: Hector Arana Jr. made the quickest run of the final session (6.783) thanks in no small part to Matt Smith deciding to sit out the final session. Smith sat out after realizing his wife, Angie Smith, qualified in the No. 16 spot. The two Smiths will race in the first round on Sunday. The No. 1 qualifier sits half a round ahead of Krawiec, more than three rounds ahead of Arana and the same for Tonglet. That’s a great situation to be in, but Smith cares about one thing: Winning the race on Sunday. 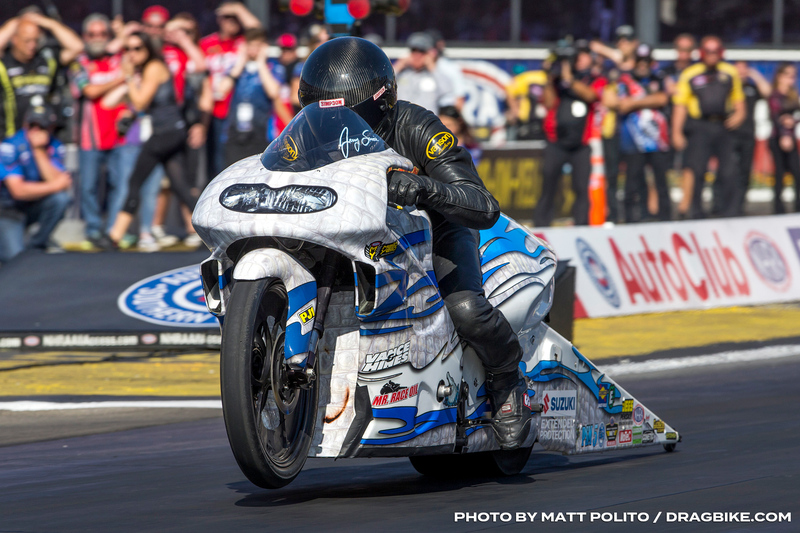 Matt Smith got a great start toward earning his third Pro Stock Motorcycle title by setting an Auto Club Raceway speed record on Friday with a 200.65 mph hit. That also made him the third member of the Denso Spark Plugs 200-mph Club, joining Hector Arana Jr. and Eddie Krawiec – perhaps not coincidentally other riders he’s battling for a championship. Smith leads Eddie Krawiec by single digits, and it’s impossible for him to make it 30 points, the number necessary to make it a full round lead. That’s why Smith is so dead focused on winning the race. Gathering as much data as possible (and making great runs) during qualifying can’t hurt, but the points matter less to Smith than getting down the track all four times – especially given the weather, which we discussed Friday. In many respects, this resembles Smith’s chase for his first championship 11 years ago, when he won the Auto Club NHRA Finals to win the whole deal. 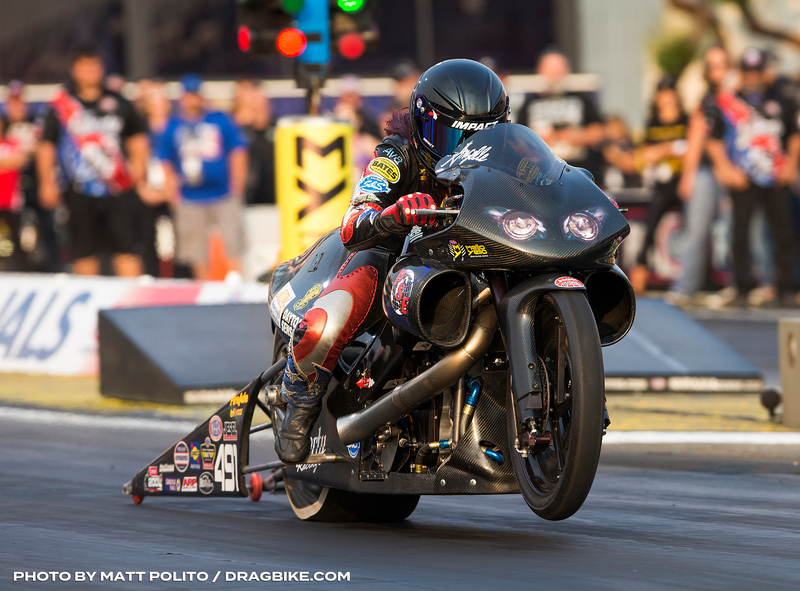 Angelle Sampey endured a tough 2017 season while helping put together a new Pro Stock Motorcycle team with Cory Reed. That hard work began to pay off this season, particularly during the Countdown to the Championship. Sampey’s average e.t. is up to ninth-best in the category during the Countdown, and she’s getting down the track 84.4 percent of the time. “The engine program is definitely moving along,” said Sampey. “These engines are still new to us, of course. Last year was a struggle, and we didn’t know much about them. We had issues with parts breakage and stuff blowing up. We didn’t have much of a chance to learn anything, which we have fixed this year. Sampey last won in 2016, defeating Jerry Savoie in Englishtown. That probably feels a lot longer ago than it was given how much has changed since then. Sampey assured us her next win will be extra special because of all the hard work Reed and new teammate Joey Gladstone are putting into the program. Sampey is currently qualified No. 12 and is chasing her first win in Pomona since 2004. Eddie Krawiec knows he has a great opportunity to capture back-to-back championships. He also knows qualifying points don’t matter at this point. 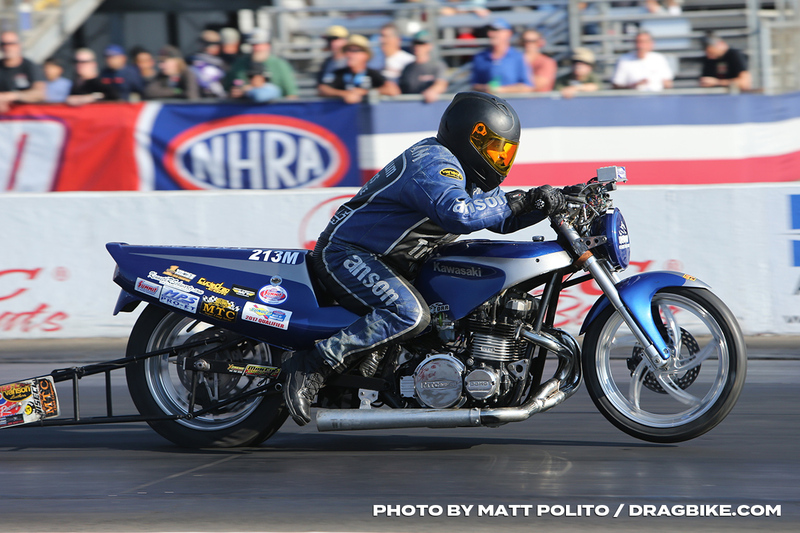 Here’s what does matter: Getting his Harley-Davidson Street Rod set up correctly for race day. 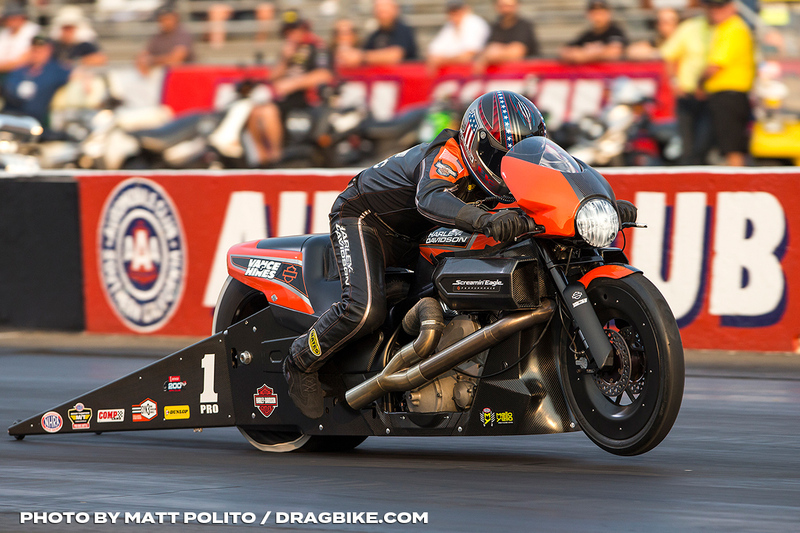 The Harley team has struggled with its 60-foot times all season, but Krawiec in particular has taken a step back recently. That change seems to have paid dividends. 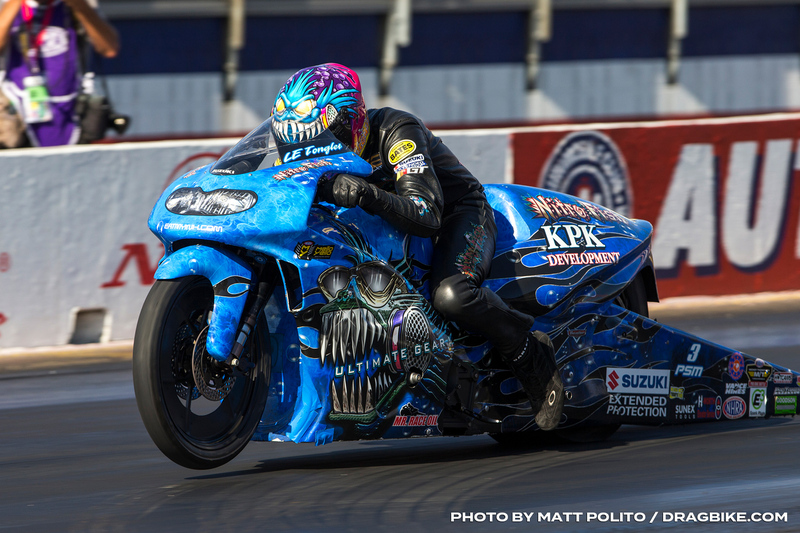 Krawiec ran a 6.789, making him the only non-Matt Smith rider to pull one off this weekend. He’s still a full three hundredths behind Smith, but that’s at least enough to show the Harley-Davidson squad they’re moving in the right direction. With Krawiec qualified No. 2 and Smith qualified No. 1, there’s a very good chance the pair won’t be able to meet up until the final – if they both make it that far. The defending 2017 champion is currently 10 points behind Smith and can pick up 30 points with every round-win. All that matters to Krawiec is the same thing that matters for Smith – winning the final race of the season. 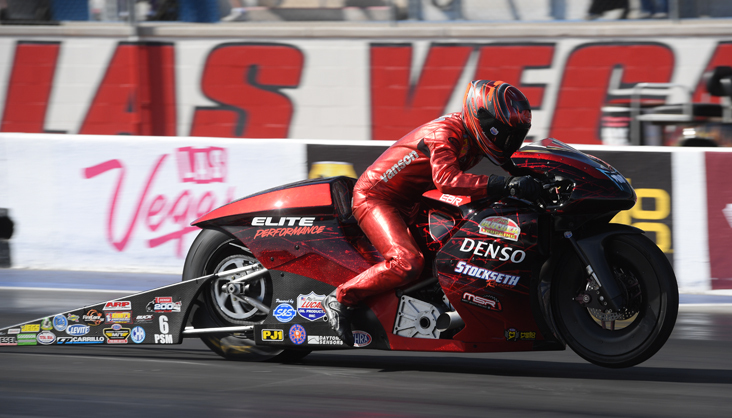 In Pro Stock Motorcycle, Smith rode to a track record speed at 200.65 at 6.774 to lead the field on his Elite Motorsports DENSO Auto Parts EBR. Smith was the quickest in both qualifying sessions. Smith is the current category points leader and seeking to extend his lead. 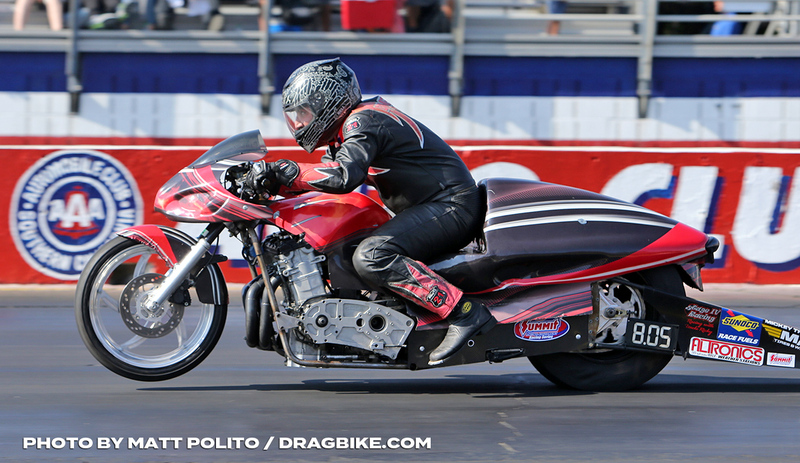 Hector Arana Jr. qualified second with his pass of 6.824 at 198.96 on his Lucas Oil TV EBR and LE Tonglet is third with his run of 6.828 at 196.39. Qualifying Round 1: Matt Smith ran the third-quickest speed of all time (200.65 mph), booking his entry into the Denso Spark Plugs 200 mph Club. Perhaps more importantly, it tightened his grip on the Pro Stock Motorcycle lead by two points because he ran the quickest time of the first session and Eddie Krawiec ran the third-quickest. Hector Arana Jr. also made a solid pass, qualifying the Lucas Oil TV EBR in the No. 2 position. That drops Arana back a point – he now trails Smith by 63 points with three qualifying sessions still to go. Qualifying Round 2: Matt Smith kept the pressure on his title challengers by earning another four bonus points with a 6.799-second pass. LE Tonglet got back into the picture with a 6.828 – that scored him three points, meaning he only dropped one point in this session. His boss, Jerry Savoie, also made a great run as the whole pack moved up in the final session of Friday. 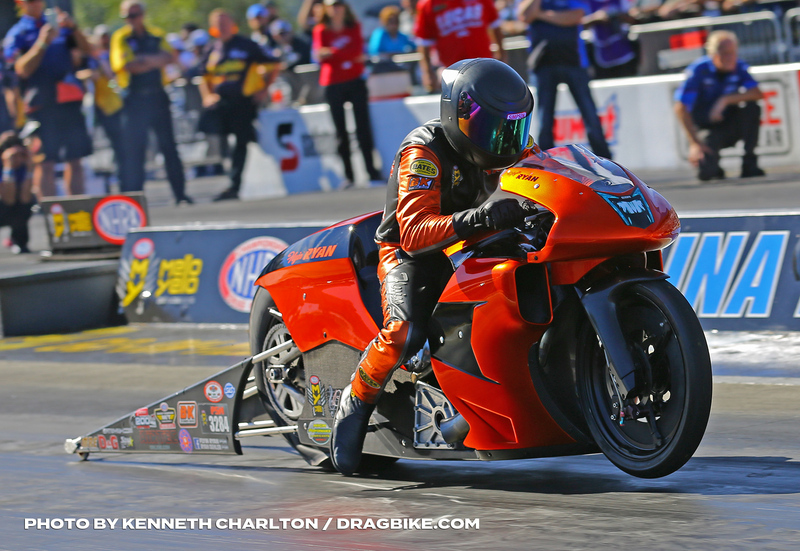 Eddie Krawiec will enter Saturday qualified fifth on the back of a 6.864 with a 197.77 mph run to back it up. That’s one of several big-speed runs given by the two-wheel class to kick off the final race of the season. 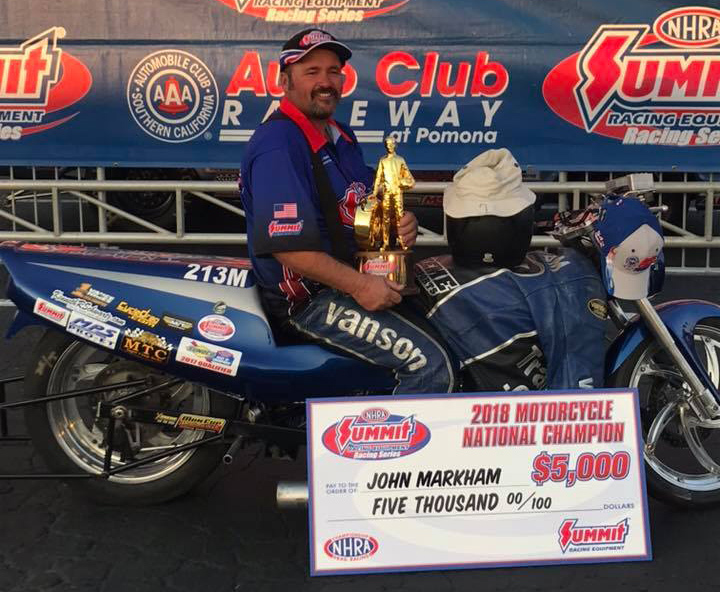 Division 2’s John Markham rode his Bowling Green, Ky.-based ’84 Kawasaki to the Motorcycle championship, cutting a near-perfect .002 reaction time that forced his opponent, Division 3’s Jeremy Hicks to break out aboard his Willard, Ohio-garaged ’16 Suzuki. Eliminations Final – JOHN MARKHAM! !